Description: BNSF 565 leads an eastbound freight toward the summit in the early hours of the day. Description: An eastbound stack train is about to cross the CN diamond in East Dubuque. Description: BNSF 565 and BNSF 8606 lead a short freight with a lot of steel coils out of Old Monroe, Mo. 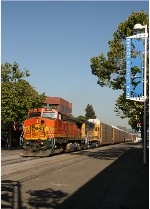 Description: A BNSF freight runs down street trackage at Jack London Square in the late afternoon. Description: BNSF Lubbock, TX South Local (Lubbock-Fullerville/Snyder/Lubbock Turn) L-KAN2811-16T charges southward at Burris on the BNSF Slaton Subdivision. 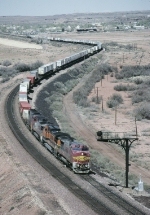 BNSF 565, BNSF 2364, 1 load, 13 empties, 542 tons, 889 feet with power. Today's train will turn at Slaton.